Step 1: Prepare the hair with TRESemmé Keratin Smooth Shampoo and Mask to achieve a smooth, sleek base without the fuss of frizz. Apply Keratin Smooth Shine Spray to the washed hair and lightly blow dry. Step 2: Divide the hair into three sections. Two sections in the front and one section for the rest of the hair. Step 3: Hold the front pieces together to avoid getting them mixed with the rest of the hair. Next, working with the rest of the hair, section out the crown and back-comb. Step 4: Tie the entire section into a low ponytail. Step 5: Release the front sections and braid both of them halfway. Secure these braids into the ponytail. Step 6: Now that all the hair is in the ponytail, take a section of the ponytail and braid till the end. 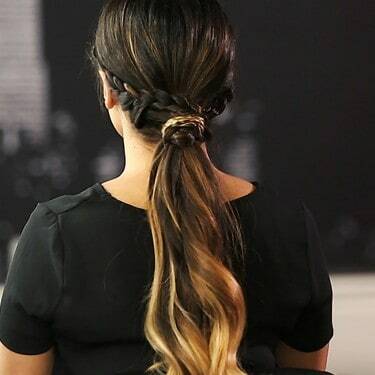 Twist the braid around the ponytail and pin for a braided hair tie look. Give this frizz free braided look a try! Style your hair into a low side bun in just 7 minutes.